and your strength will support me (Psalm 139:8-10 NLT). Horatio G. Spafford is hardly a household name, even to regular church goers who have seen his name hundreds of times. Spafford was a Chicago lawyer and real estate investor who made a fortune in downtown Chicago real estate in the years following the Civil War. But he lost everything in the Great Chicago Fire of 1871. Thinking God must have more in mind for them than just rebuilding his fortune, Spafford and his wife, Anna, became ardent supporters of Dwight L. Moody�s ministry. In 1873, they decided to take their four young daughters and go to England where they would assist Moody in an evangelistic crusade. Due to some unforeseen circumstances, Mrs. Spafford and the girls went ahead of Horatio. 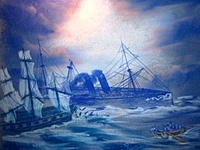 The steamship Ville du Havre on which they sailed collided with another ship on November 2, 1873 and sank in just twelve minutes, claiming the lives of 226 people, including the four Spafford daughters. 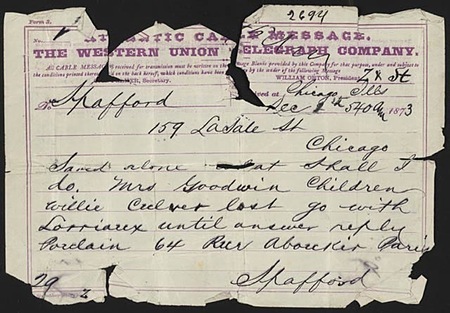 Anna Spafford, after being rescued and taken to Wales, sent a cablegram beginning with two ominous words: "Saved alone." 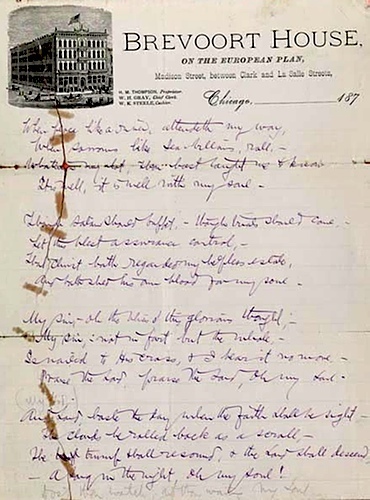 One can only imagine the heartache and despair Horatio felt, but it was in the cauldron of this loss that Horatio G. Spafford wrote the beloved hymn "It Is Well with My Soul." As they tried to recover from their loss and rebuild their lives, Horatio and Anna had two more children, a son who died of scarlet fever at the age of three, and a daughter who lived to be ninety. In 1881, the Spafford family decided to move to Jerusalem, where they spent their remaining years. Horatio explained: "Jerusalem is where my Lord lived, suffered and conquered and I wish to learn how to live, suffer and especially to conquer." Bertha, the remaining Spafford daughter, explained that her parents never started a church and never preached a sermon. They just did all the good they could, helping the poor develop cottage industries and farms, ministering to Arabs and Jews alike. They purchased a pasha's palace which became their home and base of operations, and a hospital providing care for injured soldiers on all sides during World War I. A clinic they established to serve young mothers and their babies is still operating more than a hundred years later just inside Herod�s Gate in the Old City. The Spaffords rejected the claim of some church friends that the deaths of their children were divine punishment for sin. Often criticized and even opposed by American consuls for their unconventional religious practices, the Spaffords continued their mission undeterred, gladly accepting "The Overcomers" as a name some gave their movement. The grand house they purchased and converted into a hospital was converted again into one of the most famous hotels in the world. Local residents referred to the Spaffords as "the Americans," and to their base of operations as "the American colony." The famous hotel built around their original residence is known as The American Colony Hotel, and is a favorite East Jerusalem place for foreign journalists and diplomats. During the Second Intifada or uprising in the early years of this century, I once counted seventy vehicles with "foreign press" credentials in the American Colony parking lot. For more than a hundred years, this five-star luxury hotel has been a zone of neutrality in the Arab-Jewish conflict. "It is Well" by Phillip Morrison is licensed under a Creative Commons License. Heartlight encourages you to share this material with others in church bulletins, personal emails, and other non-commercial uses. Please see our Usage Guidelines for more information. When Jesus arrived, Lazarus�s sisters were grieving and disappointed. He knew that people were fickle. They could cry out, �Hosanna!� one day, then cry out, �Crucify him!� a week later. What happened last weekend felt hopeless and dark. But this weekend says it wasn�t. He lost almost everything... except what is most important.